US occupation of Afghanistan since freaking 2002, and resulting Trillion+ Cost to American People and 1000s of US Soldiers Killed and countless Afghan Civilians Killed, under Fear Mongering that "there are Terrorists there", is just more PROOF of how the Military Industrial Complex (MIC) controls the Obama_Bush War Mongers, how it controls the Republicans and Democrats, and how right-wing entire Wall Street Media is that keeps selling these non-Ending Wars and after another War after another War after another War to US. After all, look at the Map of the World. If you do you will see that China the 2nd largest economy in the World, borders Afghanistan, repeat borders Afghanistan, and China has ZERO troops in Afghanistan and spent ZERO Dollars fighting a never ending Wars in Afghanistan. WHY? Because of course the real threat from the "Bad Evil Terrorists" in Afghanistan is actually ZERO. And instead China has spent the same Trillion Dollars spent by Obama_Bush on never Ending Afghan Wars, as War after War that they sell, on Modern infrastructure in China such as High Speed trains connecting almost all Chinese Cities, while in USA we still ride on Train from 1950s. 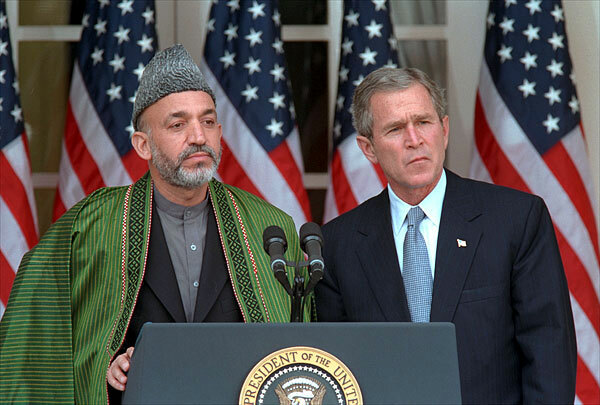 "We are never again going to let Afghanistan to be a base for the Terrorist to launch an attack on US..."
Which is exactly the reasoning given by Bush for continuing the Afghan War, after the 1st year, the 2nd year, the 3rd year, the 4th year, etc. leading to this Afghn War & occupation now being longer than WWII and WWI combined! So what freaking attack did the "Terrorist launch on US from Afghanistan..."? I mean how many missiles did they fire at US from Afghanistan? ZERO. How many Fighter air crafts did they launch at US from Afghanistan? ZERO. 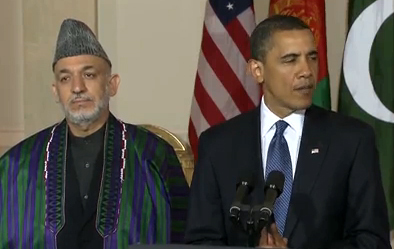 So what freaking attack is ObamaBush talking about that was launched from Afghanistan? Because NO such an attack was launched at us from Afghanistan. If ObamaBush is referring to 9/11 that was a bunch of people, mainly from Saudi Arabia, who boarded commercial planes in US and committed suicide with these planes. Even what flight training these people got, they got that from US flight schools. They even bought the $5.00 Box cutters that they uses to take over these Commercial flights from US stores. I mean they did not even bring their Weapon which was a $5.00 Box cutter from Afghanistan. The 2nd reason given to us for the never ending Afghanistan War & occupation are that if we leave then the "bad Evil monster Terrorists in Afghanistan.." will take over Afghanistan and threaten us from there. So based on above FACTS this reason is a preposterous reasoning and patently absurd for if there were really these "bad Evil monster Terrorists in Afghanistan.." THEN why have they never bothered China which has a border with them? Or if there really were these "bad Evil monster Terrorists in Afghanistan" THEN WHY has China NOT sent in any troops across the border via trains and trucks to crush these "bad Evil monster Terrorists in Afghanistan.."? BUT instead China does not have 1 soldier in Afghanistan, China has not spent $1 fighting these "bad Evil monster Terrorists in Afghanistan". So just thinks how insane this is: here is US 10,000+ Kilometers from Afghanistan and it has 100,000+ troops in this poor desolate country at the cost of $200Bill per year to US Tax payer WHILE China that borders Afghanistan has ZERO troops in Afghanistan and has spends ZERO Dollars in fighting these "bad Evil monster Terrorists in Afghanistan.."
Why China has ZERO troops in Afghanistan even though China borders Afghanistan? Because there is in fact ZERO real threat from the "bad Evil monster Terrorists in Afghanistan". And the ONLY threat that they pose is due to the fear-mongering and war-mongering by US Media, but no real threat, certainly NO threat that would warrant having US troops there. Indicating that the fear we need to have from Alqaeda/Taliban should in fact be near ZERO. And that is why China has ZERO troops in Afghanistan that borders it. The obvious question that you may have after reading the above FACTS is then why would the Big (Wall Street backed) Media in US lie and lie and lie to us about justifying this totally unnecessary Afghanistan War? 2- US Military budget was about 400Bill when the Soviet Union existed because, we were told we need a 400Bill Military budget to defend ourselves from Communist Soviet Union which has a Military with 50,000 fighter Jets, 300,000 Tanks, 5Mill soldiers, etc. etc. Well Soviet Union on its own disbanded, it has taken its Military budget down to about 20Bill per year, and how much did the US Military budget go down as a result of the threat of Communist Soviet Union not being there? Astonishingly US Military budget rather than being cut down from 400Bill per year, because the threat of the Soviet Union disappeared, it has risen to the mind bugling level of $600Bill year!!! The 2nd answer, even more insidious than the 1st answer, as horrendous as the 1st answer is, is that the (Wall Street backed) Media, aka right-wing Media, has to engage in continuous fear-mongering to distract the people's mind from realizing that in fact the Republicans and the right-wing Media that they control, are the real enemy of the American people, as per the ABSOLUTE FACT that US does not have something as basic for her people as Universal nationalized health care, something that would SAVE the lives of at least 50,000+ Americans per year, SAVE 2Mill+ Americans from going bankrupt, while SAVE the US Government/People 50% on cost of health care, and that is why ALL Conservative parties, repeat the Conservatives parties, in Europe, Canada, Japan, Australia, etc. are 100% for their Universal nationalized health care systems - More Here. Who’s Going to Win in Afghanistan? China. 1- Us is borrowing $1Trillion from China to fight a totally unnecessary War in Afghanistan, a country that borders China, to bring some stability to Afghanistan - at best. Truly only the REAL ENEMY of American people, would be for the above FACTS, which means that Republicans, Republic-rats and the right-wing Media are the true enemy of American people. What other conclusion can there be? Now just think as bad as the above FACTS are, consider this additional FACT that Romney the Republican candidate is even opposed to the Obama Admin indicating that they will (sort of) end the Afghan War by 2014. Since Romney has indicated that this would be "giving to the Terrorist" and that "we should stay the course" and "not cut & run", etc. typical Republican lunatic non-sense. But what else do you expect from them and the right-wing lying US Media! So think what lunatics Republican are, what TRUE ENEMY of the Nation they are, that they say "We are broke", "Deficits Deficits Deficits", "Cut Spending", in opposing any investment (aka Spending) in American People, Cities and States while they instantly approve Spending $200-Bill per year in Afghanistan fighting an enemy that has ZERO Planes, ZERO Ships, ZERO Tanks, ZERO etc. real Weapons, an Afghanistan that borders China, in which Afghanistan China has spend ZERO Dollars in fighting these so called "Terrorist" as a result of which China has a HUGE Surplus vs US having HUGE Deficits, as a result of which China is making 100s and 100s of Billions of Dollars of investment (aka Spending) in High Speed train, Renewable Energy, etc. as a result of which China has 9% growth rate, 4% unemployment, home prices going up nicely, almost ZERO foreclosures, etc. good economic news vs US having high unemployment, low growth rates, record foreclosures, etc. economic misery news. More example of US & NATO caring for Civilians in general and people of Afghanistan in particular. I guess they want to bring the same relief and life to people of Syria as they are bringing to people of Afghanistan such as these 8 Women that were killed in another US/NATO air strike. "... ZEROS are the arsenal (the threat) from Taliban or Alqaeda." Tell this LIE to freedom-loving People of Afghanistan who were suppressed and killed by the Taliban while harboring the TRUE-EVIL of the world, the Satanic al-Qaeda; curse their children and their evil spawn who sacrifice their own for the lust of virgins; cursed be their way; sick be their minds polluted by radical Muslim belief. 1st, you moron: Taliban, aka Mujahedin Khalg, was funded and created by CIA. Against the recommendation of all thinking people. 2nd, "People of Afghanistan" can rise up against their oppressors as people in other countries have. 3rd, NON of this is argument for US troops being in Afghanistan. "... because, we were told we need a 400Bill Military budget to defend ourselves from Communist Soviet Union which has a Military with 50,000 fighter Jets, 300,000 Tanks, 5Mill soldiers, etc. etc. Well Soviet Union on its own disbanded, ..."
and a few thousand nuclear weapons! thanks to large military spending of USA and Strategic Defense Initiative (Star Wars) gambit to which USSR could not compete and which contributed to the Peoples Republic of Soviet Union collapse. Allah praise Ronald Reagan God rest his soul. No Moron, USSR disbanded because they were sick and tires of playing the Cold War game with US Military industrial complex. More to the point, Russians top goal and dream is to be in Europe, from owning homes in South of France to going to clubs in Ibizia, etc. "How many Fighter Planes does Alqaeda have? ZERO." Technically this 'fact' is correct. al-Qaeda is a global militant Islamist organization founded by Osama bin Laden. But as the world knows, terrorists hijacked 4 planes and crashed them and all their occupants into the World Trade Centers (the trade partners) and the Pentagon and one PA field. Thus, al-Qaeda needs no 'Fighter Planes' but are and have shown to be a threat to the USA and freedom-loving people (and Muslims) of the world. If al-Qaeda were a threat to China, they'd spend a few yuan in Afghanistan just they have in Tibet where his holiness the Dalai-Lama can no longer live and who is the true leader. But, as the world knows, China is a paper tiger incapable of even helping the True People of Syria, the true friends of Israel. China is interested only in selling and stealing anything they can to prop up their dehumanizing regime. Free the People of China. "China is a paper tiger" REALLY! And how did you arrive at that insane conclusion? What China needs to wage War on countries in Central America, 10,000K from China, As US has been waging War on countries in Middle Eat, 10,000K from US, for China not to be a "paper tiger"? And then you say "Free the People of China"! The main reason we (the US) has such large deficits is as much related to the movement of manufacturing jobs overseas as anything. Real wealth is created with manufacturing jobs. In the '60s the US manufactured 25% of the world's goods. Currently we manufacture much less than 10%, and most of those are not exported. Result of this is more dollars being sent overseas than are incoming. Result of this is the impoverishing of America. In the '70s more and more households were supported with 2nd income earners. During the 80's this became the norm with most households requiring a 2nd income earner to maintain standards of living. During the 90's we maintained our standards by ever increasing personal debt. This all came to a head in the 21st century when we could no longer sustain such historic levels of personal debt, and now public debt has reached unsustainable levels. The wars have merely exacerbated an already bad situation. China has surpluses because it is now mfg the world's goods. To make the argument that the above article does, which is that deficits are due to the wars, and China's surpluses are due to our wars, is incredibly facile, simplistic and obtuse. The wars are contributing to the problem here, no doubt, but they are not but a part of the problem. You are bang on with this article. In fact China is ULTIMATE proof of what Lunatics Republicans are, really what ENEMY of American people they are. WHY? Because China has a HUGE Surplus vs HUGE deficits in US which supposedly Republicans, Republicrats* and the right-wing (LYING) Media are worried about. And China is now the 3nd largest economy in he World after EU and US. And is expected that within few years China will become the largest economy in the World. So what is China? "Government does not create Jobs...", etc. and on the other hand they have invested Trillions of Dollars in China, which means have moved Millions of Jobs from US to China, and China is a Communist Capitalist country. Related to this article I would like to also add that US should pull out of South Korea too. OTN, have you been reading the recent fear mongering and warmongering by US Media about South Korea and North Korea? And of course immediate dispatch of US Air craft careers and troops at God knows what cost to American Tax payers? 1) South Korea has an unemployment rates of about 3.7%, which means she has near full employment vs unemployment rates in US of 9.8% or 20% if you go by actual rates. 3) South Korea has Universal Nationalized Health Care so all her citizens get health care for the Taxes that they pay and ZERO South Korea goes bankrupt each year due to health care costs vs US where 50Mill have NO health care and 2Mill+ go bankrupt each year due to health care costs. So South Korea does not need US which is a poor bankrupt country now to be spending $100s of Billions of Dollars of American Tax payers money to defend her from her MUCH SMALLER northern neighbor when US cannot even provide health care to all its people. Moreover China that borders the Koreas also has a HUGE Surplus vs US having a HUGE deficits and near FULL Employment too, so if anyone should play police man in that area, it should be China and not US which is a poor bankrupt country now compared to China or South Korea.